Twenty-one days, ten trains, seven countries and four friends. It might sound like chaos to some, but it was an incredible three weeks of my life that I will never forget. We got up in the early hours to catch our flight from London Gatwick. I had that excitement you’d feel going on holiday as a kid; waking up and travelling to the airport all before the sun rose. Arriving at the airport with our hiking bags, we checked-in, went through security, polished off a Full English Breakfast in Wetherspoons and boarded our plane. Berlin was our first destination. After landing at Schönefeld Airport, we took a train into the centre, followed by the underground (U-Bahn) to the hostel. This provided us with a good glimpse of the city, the history of which jumps out. By joining a free walking tour, you can learn so much about Berlin’s rich history. Ours included the Memorial to the Murdered Jews of Europe, Checkpoint Charlie and the car park where Hitlers underground bunker once stood. Something you’d find hard to miss is the Berlin Wall. It still stands in many areas of the city. It was built by the Communists in 1961 with the intention of surrounding West Berlin. Anyone trying to cross it was shot. It was finally demolished in 1989. Seeing the wall in person is mind-blowing due to its scale. Today, Berlin is a flourishing city with a diverse inhabitance. It’s a quirky place with locals adopting a more laid-back approach to life, making it an ideal destination to begin our Interailling adventure. It was time to move on to our next country, the Czech Republic. We boarded our first Interail train to the capital Prague. Arriving at Prague railway station, we began our trek into the city centre to locate our hostel. For us, it immediately felt homely. I think aside from the beautiful architecture, impressive river and fascinating history, it was the Hamley’s toy store, Tesco and Marks & Spencer that provided us with a slice of the UK. We took a full day to roam the city and its surroundings. 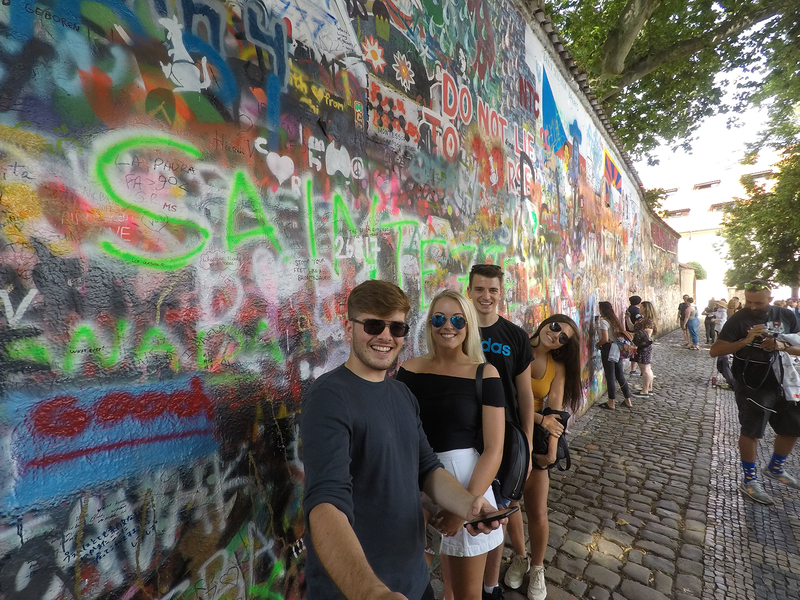 Some must sees were the Astronomical Clock, Charles Bridge, John Lennon Wall and Jewish Quarter. A climb up a hill on the other side of the river takes you to Letná Park. It’s the perfect place to escape the busy centre, so we sat down for a beer (which is super cheap by the way) and enjoyed the stunning view of the city. 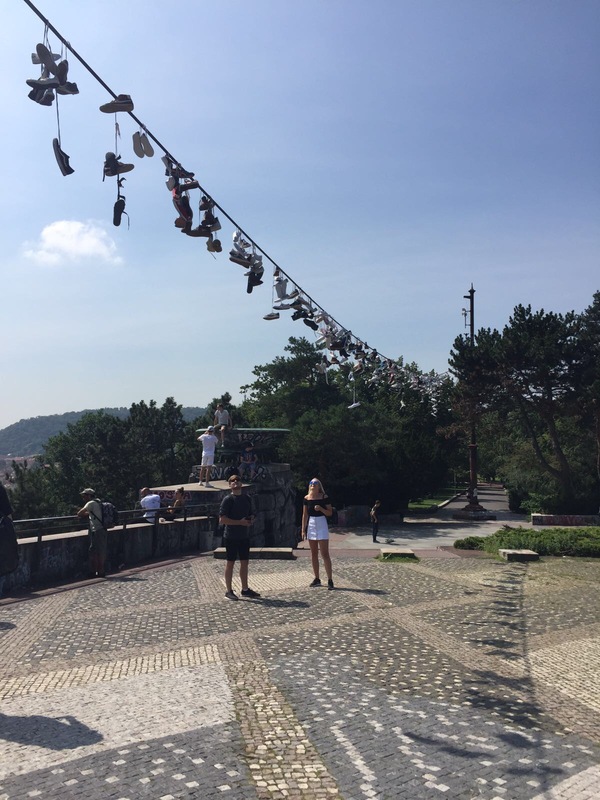 Up on the hill, you’re also bound to come across a power line by the Metronome with up to a hundred shoes hanging from it. I have no idea what it signifies, but it provides the perfect opportunity for an Instagram. Prague also has a VERY good nightlife. We joined a bar crawl which we paid for, but it was well worth it. You got unlimited beers, wine and shots in the first bar and a few free drinks in the remaining bars (I can’t remember exactly how many, which tells me it was a lot). We got along great with everyone on the crawl and ended up in Karlovy Lazne Nightclub, five floors of insanely incredible madness. Our night ended with a trip to McDonald’s, obvs! Next up, Poland! And the first overnight sleeper train. What an experience! I don’t think we slept a wink because of the excitement, but also the fear of falling out of our beds. The next morning we pulled into Kraków Główny train station. “Hello Poland!” I shouted from the train window. Many people I know have visited Kraków and have rave reviews of it. So this might be unwelcome, but we weren’t blown away by it. It was a very ordinary city with little seemingly going on. We did however welcome the free tea and coffee available at our hostel and the presence of a Hard Rock Cafe in Kraków’s Main Square. However, the main reason for us including Kraków into our trip was so we could visit Auschwitz Concentration Camp. Growing up, we learnt about World War II and the murder of six million Jewish people by the Nazi regime. However, you can only truly understand the scale by visiting a Nazi concentration camp. Out of this entire trip, if there’s one place I urge you to go, it’s Auschwitz. By joining a tour from Kraków, you get a bus which takes you to Auschwitz I and Auschwitz II-Birkenau. It was a surreal and emotional day which gave us a greater understanding of the atrocities that took place during World War II. The next day, we checked out of the hostel and explored. We stumbled across an old quarry turned lake and later spent our evening in a shopping centre before boarding our overnight train to Budapest in Hungary. I was excited for Budapest, because I had heard a lot about it. Spoiler alert: IT WAS AMAZING! The Hungarian capital is split by River Danube. Its 19th-century Chain Bridge connects the hilly Buda district with flat Pest. Buda + Pest = Budapest. The city itself is fantastic to explore day and night. During the day, take in the architecture and stunning landscape. 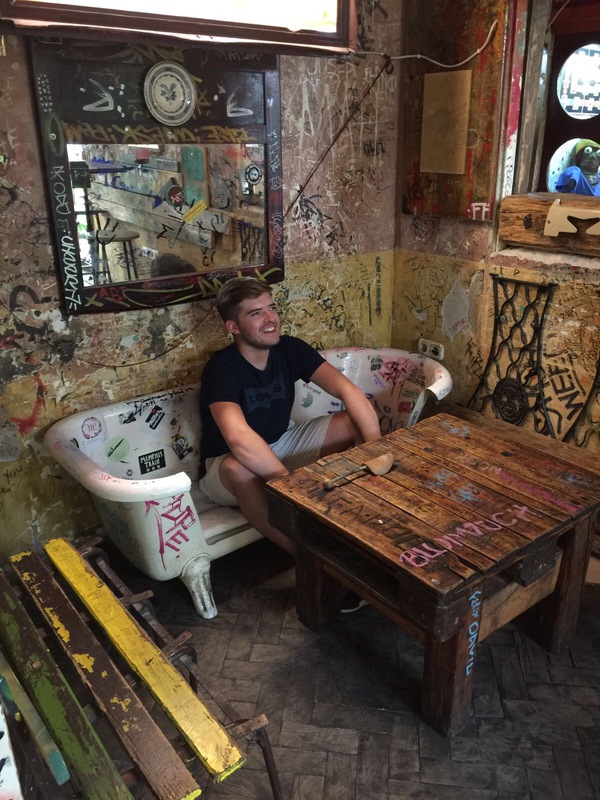 At night, head to the ruin bars – they are something else! Food and drink is cheap in Budapest and one evening we decided to eat out. I’m not exaggerating, I was blown away. The meal wasn’t only extremely good value, it was delicious and the restaurants atmosphere was ace. On the last day, we went to a waterpark and that evening got a tram to the train station. 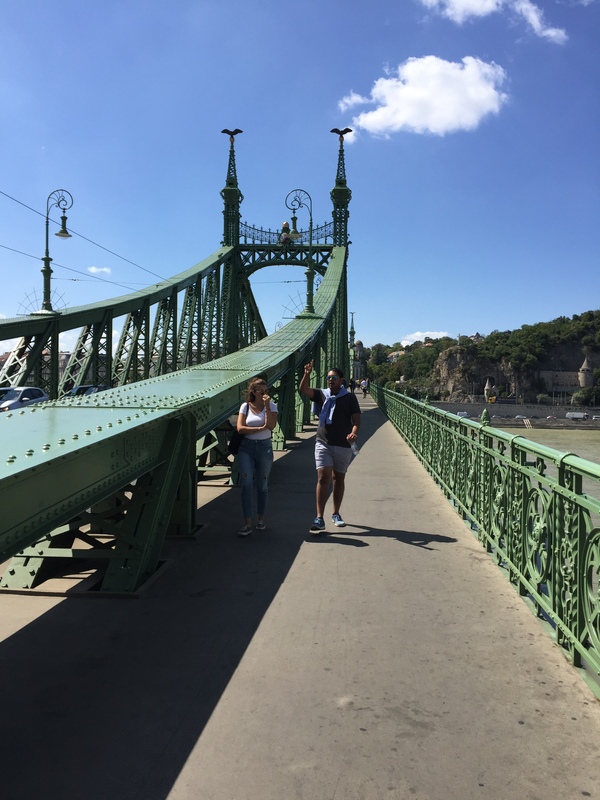 It was a journey which took us out of the city centre and through the non-tourist areas of Budapest. We got to the station and our sleeper train wasn’t even on the departures board. In fact it only displayed on the board a few minutes before its arrival, so we had to leg it. It was a beautiful ride out of Budapest through Hungary. We settled down for the night in what was the train from hell; horrifically hot, beds that felt like wood and for the two of us on the higher beds, the fear of rolling out the window which we had to have open. It was such a laugh though. What a journey it was through the rocky landscape of Croatia, somehow they built a train track on it. We got to the small railway station in Split and made our way to the Airbnb – yep, we decided to change things up. Split is known for Diocletian’s Palace, erected by the Roman emperor in the 4th century. Today, its remains include hundreds of shops, bars, cafes, hotels and houses. It’s also know for being very hot in the summer, so pack your sun cream! 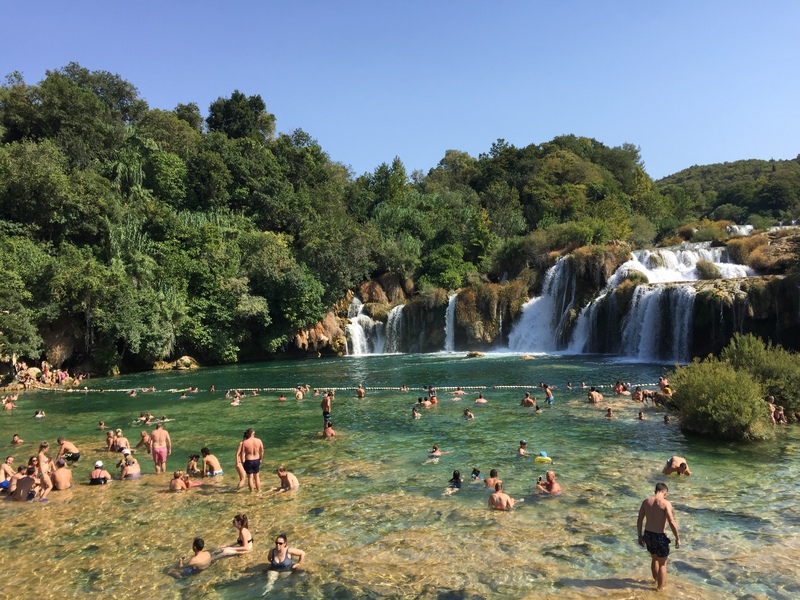 There are many day trips you can take from Spilt, including the waterfalls at Krka National Park and beach clubs on Hvar island. Ferries depart Spilt regularly to Hvar; the journey takes an hour and a half. 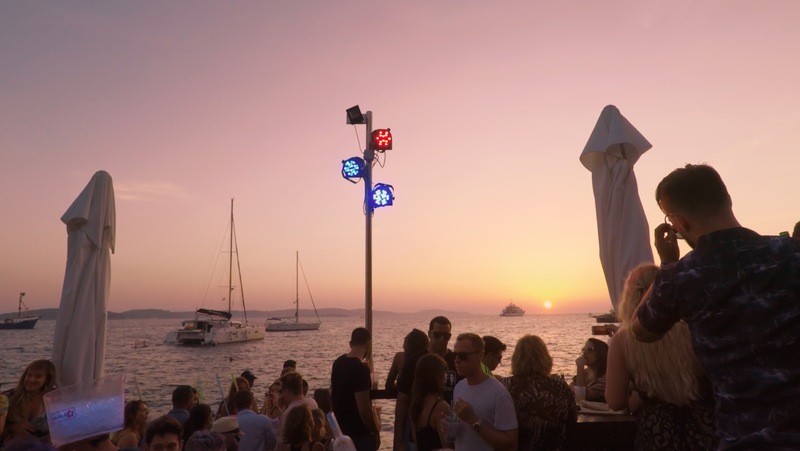 The crystal clear sea, luxury yachts and Ibiza style beach clubs made it an Interrailing highlight. A tip for you though… if you fancy spending the evening watching the sunset with a few rum and cokes, check the return ferry times! We wrongly assumed they ran until the early hours. This resulted in the most hilarious hysterical night of our lives, trying everything to get home. 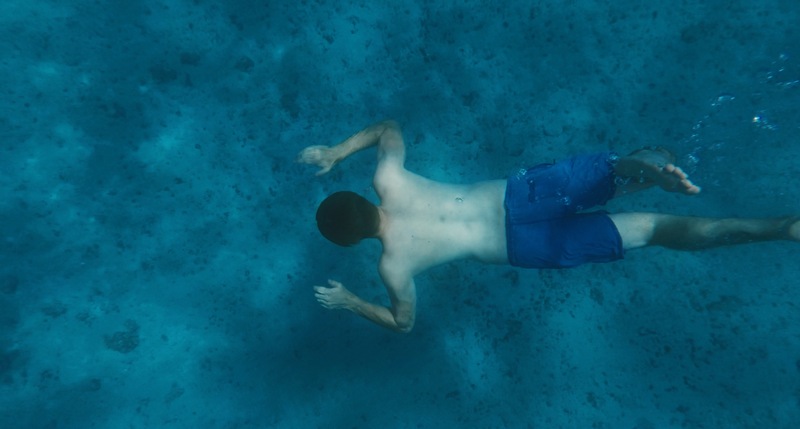 We asked strangers and boat captains how we could get back to Split and they’d just laugh. Our last resort was to see if we could get to the other side of the island in time for the final car ferry that was leaving the bigger port. We had thirty minutes until it was due to depart and our Google maps were telling us it was a fifty minute drive. Approaching the taxi rank with little hope, we asked one driver if it was possible, “yes my friend, quick” was the response. My life flashed before me on that drive. I had never seen driving like it. We did get there though, with one minute to spare. 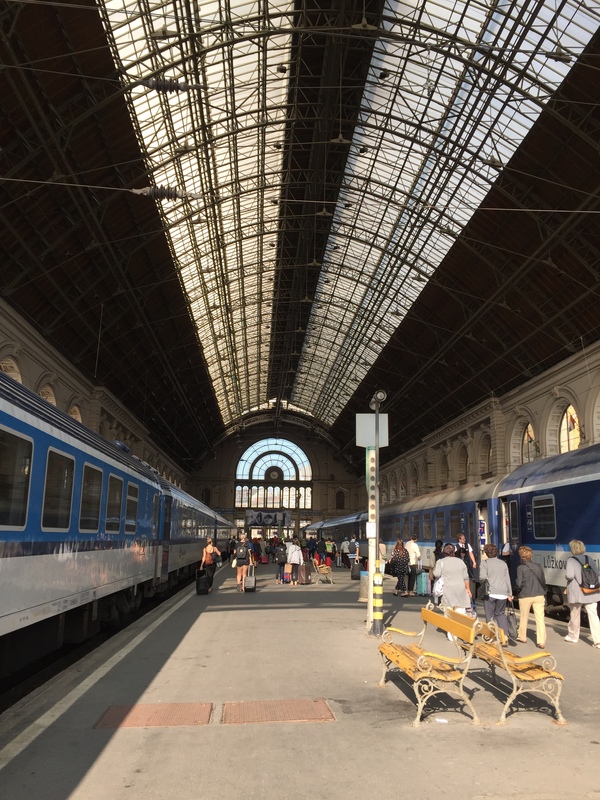 We left Split for our last overnight train to Zagreb, the Croatian capital. It was a brief visit before catching a train to the capital of Slovenia, Ljubljana (still struggling with pronunciation of that one). The capital is pretty, but there’s not a huge amount to do. However, you reach Lake Bled after a two hour bus journey, a scenic lake surrounded by mountains and forest. You can take part in many activities; we hired a rowing boat and visited the island in the middle of the lake which houses a historic church. Next we were off to the hills that are alive with music, Salzburg in Austria. If you don’t like The Sound of Music, then you’ll struggle to get away from it here. Going through Austria by train was a jaw-dropping moment. You are surrounded by mountains and it was by far the nicest train we had been on – big shoutout to Austria’s railway! Salzburg is a great place to sightsee. You can walk around easily, as long as you don’t have a hiking bag on. It’s a pristine city and The Sound of Music clearly rubs off on the locals, because they’re all very kind. It is expensive though, so it’s worth factoring that in, particularly if you’re visiting towards the end of your Interrailing journey. It was time to head back to Germany and spend our last few days in Munich. I have to be honest, it was a little disappointing. Not only was it our worst hostel experience, we just couldn’t warm to the city – perhaps not helped by the miserable weather. Munich being famous for beer Kellers made us determined to make the most of our visit – many steins were consumed. 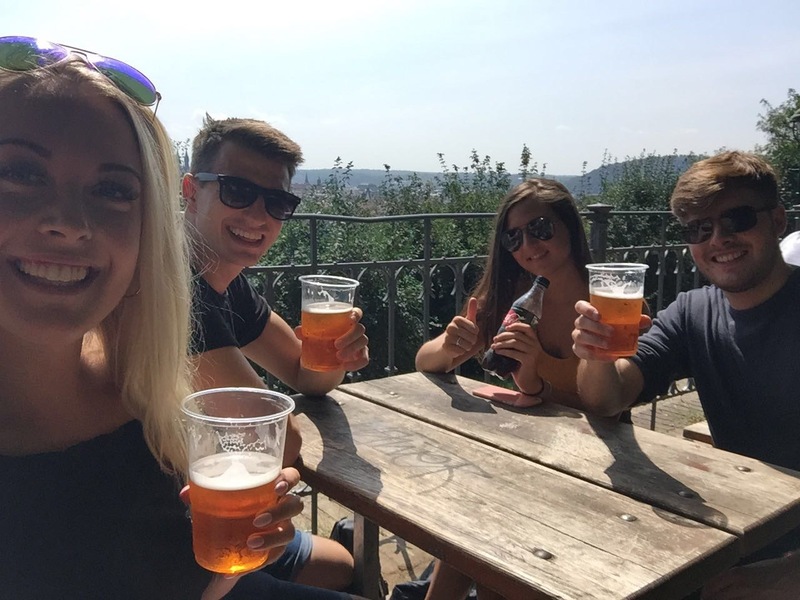 From Munich, we travelled to the German city of Nuremberg to catch our flight back to London. We had half a day to look around – it was a lovely place, so do pop in if you’re going past! Three weeks, seven countries later and I still wasn’t ready to go home. It was one of the best experiences. Not only did it let me enjoy the beauty of different countries, it made me learn about their culture and appreciate their history. Above everything though, it strengthened the friendship I have with my three best mates.